Securing hemostasis during laparoscopic partial nephrectomy requires advanced laparo-scopic skills and has thus limited the wider use of the laparoscopic approach for nephron-sparing surgery. Various techniques of parenchymal hemostasis have been reported in an attempt to establish a technically simpler method of securing hemostasis (12-14). 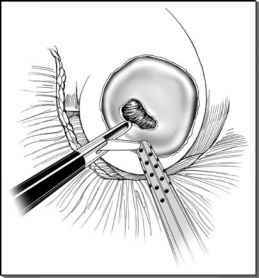 Employment of laparoscopic harmonic scalpel, microwave coagulator, argon beam coag-ulator and application of fibrin glue may be helpful for mild parenchymal surface oozing. Vascular control by circumferential compression of the renal parenchyma using renal tourniquets and cable tie devices has been used during polar partial nephrectomies (15,16). Generally speaking the effectiveness of such devices is not clinically investigation. Other investigational hemostatic aids include prior microwave thermotherapy (17), or radiofrequency coagulation of the tumor with a needle probe followed by laparoscopic partial nephrectomy without hilar control (18). Laser tissue welding using human albumin as a solder to control bleeding and seal the collecting system during laparo-scopic heminephrectomy system was described in the porcine model (19).